For other uses, see Crocodile Tears (disambiguation). 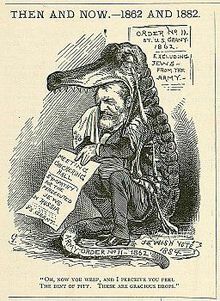 A cartoon by Bernhard Gillam depicting Ulysses S. Grant courting Jewish voters by crying "crocodile tears" over the persecution of Jews in Russia. The cartoon contrasts Grant's expressions of outrage with his own earlier military order to expel Jews from within his lines. He received a majority of the Jewish vote in the 1868 presidential election and would go on to place a record number of Jewish people into high office up to that point in time. Crocodile tears (or superficial sympathy) is a false, insincere display of emotion such as a hypocrite crying fake tears of grief. The phrase derives from an ancient belief that crocodiles shed tears while consuming their prey, and as such is present in many modern languages, especially in Europe where it was introduced through Latin. While crocodiles do have tear ducts, they weep to lubricate their eyes, typically when they have been out of water for a long time and their eyes begin to dry out. However, evidence suggests this could also be triggered by feeding. Bogorad's syndrome is a condition which causes sufferers to shed tears while consuming food, so has been labelled "crocodile tears syndrome" with reference to the legend. The expression comes from an ancient anecdote that crocodiles weep for the victims they are eating. A collection of proverbs attributed to Plutarch suggests that the phrase "crocodile tears" was well known in antiquity: comparing the crocodile's behaviour to people who desire or cause the death of someone, but then publicly lament for them. The story is given a Christian gloss in the Bibliotheca by early medieval theologian Photios. Photios uses the story to illustrate the Christian concept of repentance. The story is repeated in bestiaries such as De bestiis et aliis rebus. This tale was first spread widely in English in the stories of the travels of Sir John Mandeville in the 14th century. In that country and by all Inde be great plenty of cockodrills, that is a manner of a long serpent, as I have said before. And in the night they dwell in the water, and on the day upon the land, in rocks and in caves. And they eat no meat in all the winter, but they lie as in a dream, as do the serpents. These serpents slay men, and they eat them weeping; and when they eat they move the over jaw, and not the nether jaw, and they have no tongue. A later writer, Edward Topsell, provided a different explanation for the tears, saying "There are not many brute beasts that can weep, but such is the nature of the crocodile that, to get a man within his danger, he will sob, sigh, and weep as though he were in extremity, but suddenly he destroyeth him." In this version, the crocodile pretends to be in distress to lure prey into a false sense of security. However, Topsell also refers to the older story that crocodiles wept during and after eating a man, repeating the standard Christian moral that this signified a kind of fake repentance like Judas weeping after betraying Jesus. Shakespeare regularly refers to the concept. He uses both of Topsell's versions of the motive, as a trick and as fake repentance. A prominent example is in Othello, Act IV, Scene i, in which Othello convinces himself that his wife is cheating on him. He also refers to the version about tricking prey in Henry VI, Part 2, Act III, Scene i, in which a character refers to the faked emotions of the Duke of Gloucester: "Gloucester's show / Beguiles him, as the mournful crocodile / With sorrow, snares relenting passengers." In Antony and Cleopatra, Act II, Scene vii, Mark Antony chides Lepidus, who has asked him what crocodiles are like, with a meaningless description ending with the words "And the tears of it are wet". Shakespeare's contemporary Edmund Spenser also refers to the story in The Faerie Queene, writing of the "cruel crafty" creature "which, in false grief, hiding his harmful guile / Doth weep full sore, and sheddeth tender tears. In Henry Purcell's 1688 opera Dido and Aeneas, (librettist Nahum Tate), when Aeneas tells Dido he must abandon her to found Rome on the Italian Peninsula, she proclaims, "Thus on the fatal banks of Nile, / Weeps the deceitful crocodile." It is difficult to trace the origin of this particular myth, but it's easy to see why it has become so popular – for an apparently remorseless creature such as a crocodile to actually weep over its victims is a memorable irony which has inspired considerable prose and created a phrase which is still popular today. In 2006, neurologist Malcolm Shaner, assisted by Kent Vliet, a researcher at the University of Florida, decided to test the story that crocodiles or their close relatives alligators and caimans were likely to "weep" while feeding. Studying animals in Florida's St. Augustine Alligator Farm Zoological Park, Vliet recorded seven caimans feeding. He chose to use caimans rather than crocodiles because at the sanctuary they could be observed feeding on dry land. Five of the seven animals were seen "weeping", leading to the conclusion that the story describes a real phenomenon. The researchers suggest that the "weeping" may be caused by the hissing of warm air during feeding, which is forced through the sinuses, stimulating the animals' tear glands into emptying fluid into the eye. The phrase gives its name to Bogorad's syndrome, colloquially "crocodile tears syndrome", an uncommon consequence of recovery from Bell's palsy where faulty regeneration of the facial nerve causes sufferers to shed tears while eating. Russian neuropathologist F. A. Bogorad, who first described the condition in 1926, did so in an article entitled "syndrome of the crocodile tears" (also translated as "the symptom of crocodile tears"). Bogorad argued that the tears were caused by the act of salivation. ^ a b Arnaud Zucker (ed), Physiologos: le bestiaire des bestiaires, Jérôme Millon, 2004, p.300. ^ PHOTIUS (1977). Bibliothèque. Tome VIII : Codices 257-280 (in French and Ancient Greek). Texte établi et traduit par R. Henry. Paris: Les Belles Lettres. p. 93. ISBN 978-2-251-32227-8. ^ John Ashton (2009). Curious creatures in zoology. ISBN 978-1-4092-3184-4. ^ a b Sax, Boria, The Mythical Zoo: An Encyclopedia of Animals in World Myth, Legend, and Literature, ABC-CLIO, 2001, p.70. ^ Whyile, Dan. "Crocodile tears idiom origin". Theidioms.com. Retrieved 28 September 2018. ^ Britton, Adam (n.d.). Do crocodiles cry 'crocodile tears'? Crocodilian Biology Database. Retrieved March 13, 2006 from the Crocodile Specialist Group, Crocodile Species List, FAQ. ^ Morais Pérez D, Dalmau Galofre J, Bernat Gili A, Ayerbe Torrero V (1990). "[Crocodile tears syndrome]". Acta Otorrinolaringol Esp (in Spanish). 41 (3): 175–7. PMID 2261223. ^ McCoy, FJ; Goodman, RC (Jan 1979). "The crocodile tear syndrome". Plastic and Reconstructive Surgery. 63 (1): 58–62. doi:10.1097/00006534-197901000-00010. PMID 432324. ^ F. A. Bogorad (trans Austin Seckersen), "The symptom of crocodile tears", Journal of the History of Medicine and Allied Sciences, 02/1979; 34(1):74-9. ^ Lester Allen Russin, "Paroxysmal Lacrimation During Eating as a Sequal of Facial Palysyndrome of Crocodile Tears", JAMA. 1939;113(26):2310-2311. 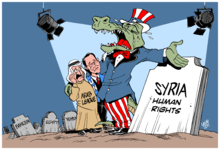 Look up crocodile tears in Wiktionary, the free dictionary. "No Faking It, Crocodile Tears Are Real". Science Daily. 2007-10-07. Retrieved 2008-08-14.